This little helicopter is going to give me some air recon capability. The rotor disc is cut from a piece of blister-pack plastic and fixed in place with a pin stub. Construction was a bit fiddly, but not too bad. Nowhere near as nightmarish as their WW1 biplanes. 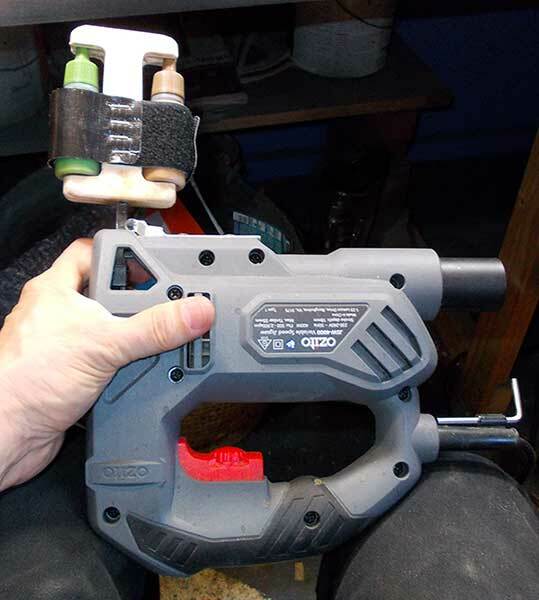 I've been using a cheap $20 jigsaw to shake the bejeezus out of my paints for a while, and it works very well. Up until now, I've just been clamping the paint bottle to the masking-tape wrapped blade of the jigsaw with a bulldog clip, and that has worked OK, but from time to time I do get a flying paint bottle. Also, it's a bit of a faff getting everything mounted properly. So, I've made this modification. The main body of the frame is just a bit of plywood that I've cut out, drilled, and epoxied to the jigsaw blade. I filed down the teeth of the blade for safety's sake. The bottles are held in place by some bits of velcro I had left over from some household job or other; they're just stapled to the plywood frame. 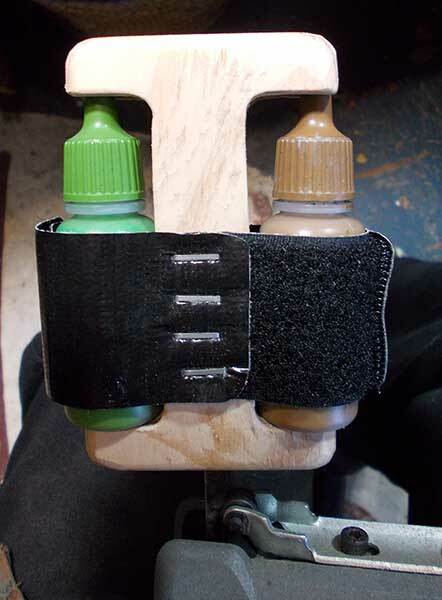 I can shake two bottles at a time with this setup, though how the jigsaw will cope with all the extra weight and vibration in the long term I don't know. It cost very little though, so I'm not risking much. I cut a notch in the cap end of the frame to give the bottle some lateral stability. I don't know how necessary that is, but it can't do any harm. This is the bulk of my APCs finished, though I still have a few Spartans to do. 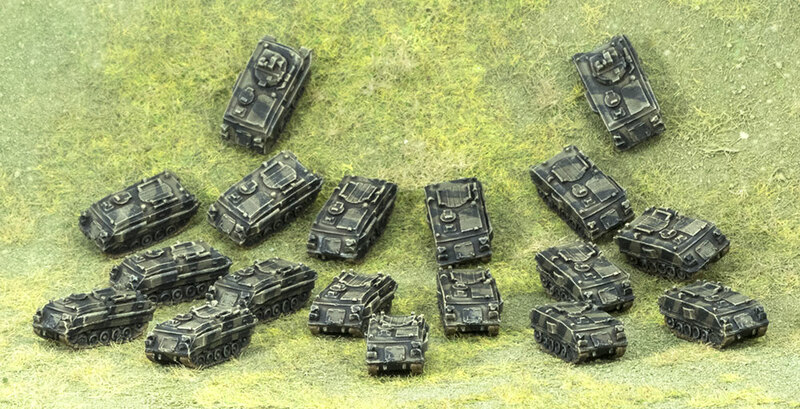 These are the British FV432, from Heroics & Ros. The two at the very back mount the Swingfire missile system, while all the others are pure APCs. I accidentally ordered these twice, so I have twice as many as I actually need for the size of force I was intending. Oh, woe is me, to have too many toys. I just realised that I forgot to paint the exhaust pipes running down the port side. I'll have to get on to that. These are the new Heroics & Ros sculpts of the 1980s British GPMG teams, with the guns on tripods in their sustained-fire mode. The red beads are a visual aid for my own reference, since my eyesight is no longer what it once was: red means a machine-gun of some kind. I use other colours to indicate other weapon loads. It also gives me the team's facing, since the bead is always at the rear of the base. Here's one of the ATGM configurations of the CVRT, the Striker. They mount five Swingfire missiles in the launcher at the back of the hull top; these are moulded in their firing configuration, which is good, since with the launchers lowered it's a bit difficult to distinguish the Striker from the Spartan APC, especially with eyesight as crappy as mine. The models are Heroics & Ros 1/300 scale, and they're pretty good. The only real issue I have with them is that there's a fairly large casting channel entering the body of the model right over the rear access door, which is a pity. It would be quite difficult to clean it off properly while keeping the access hatch, and I haven't really bothered; I just cut off the excess as close as I could manage it and left it at that. Here we go on the troop transports. They're FV432 APCs by Heroics & Ros. 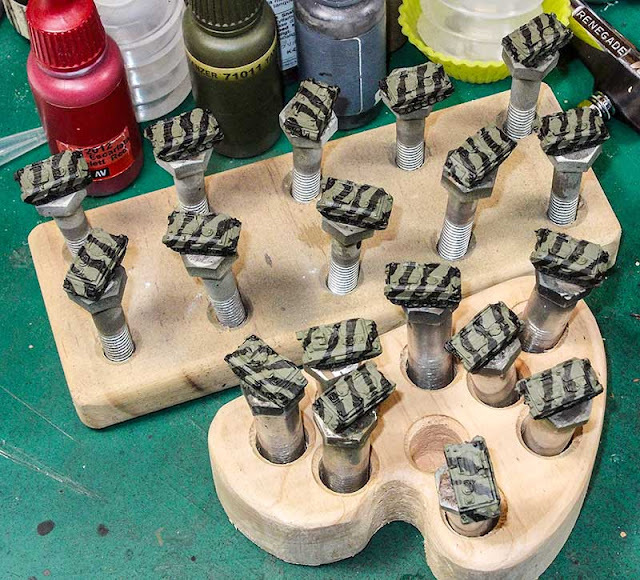 There are a couple of Swingfire turrets in amongst them too; I debated leaving those in overall green without any disruptive camo, to differentiate them visually from the APCs, but in the end I gave them their stripes too. I'm about half-way through painting this lot, and at the moment they're looking to me like a lot of licorice allsorts. Next step is dry-brushing to bring out the highlights, then painting the tracks, and finally a wash to define the shadows. If the Chieftain was the archetypal British tank when I was growing up, the Hawker Harrier jump-jet was the archetypal British aeroplane. With its VTOL capability and futuristic lines, it evoked all kinds of "Captain Scarlet" associations in my juvenile mind. 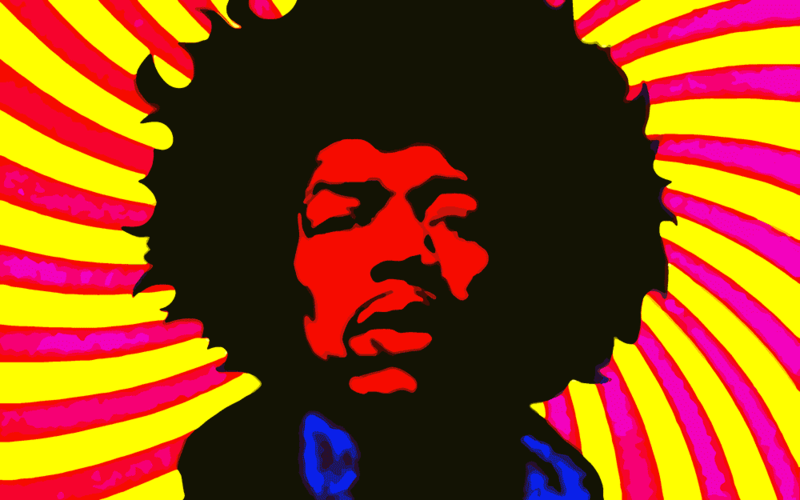 Apparently it was not without its shortcomings, but I knew nothing of them and just thought it was indescribably cool. This 1/300 model is from Heroics & Ros (as usual), and will hopefully serve to give my ground troops a bit of air support. 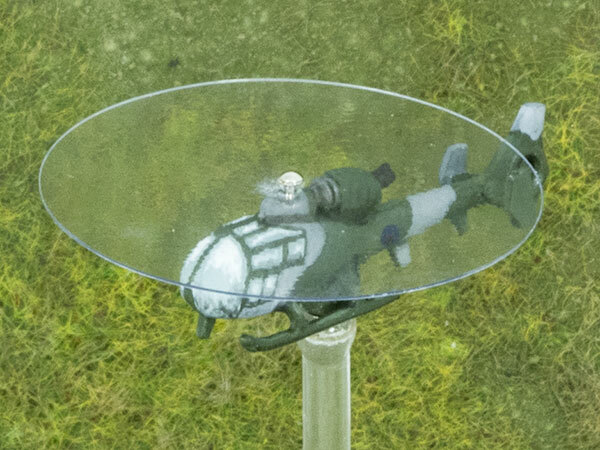 To tell the truth, I haven't really examined the air support rules in any detail, so I probably should do that. 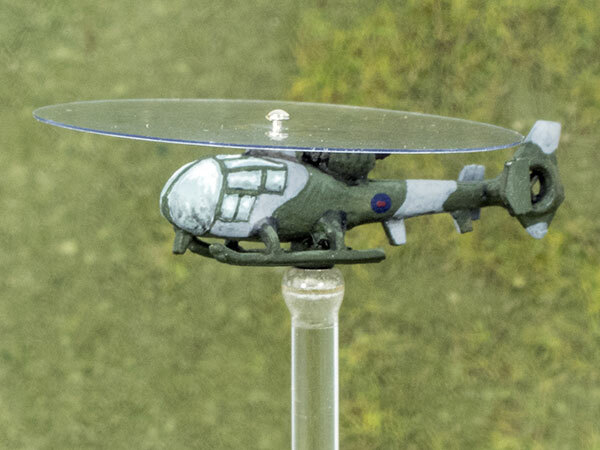 Occasionally — not often, but from time to time — my tabletop wargaming involves aircraft. It might be a specifically aerial dogfighting game, or it might be the aerial component of an all-arms game. The thing about aircraft is that they need to be up in the air, or they just look stupid. 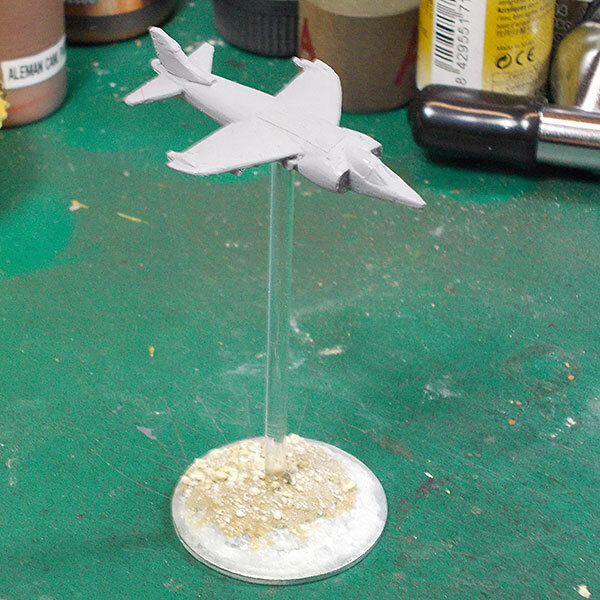 So, here's how I make the flight stands for my planes. 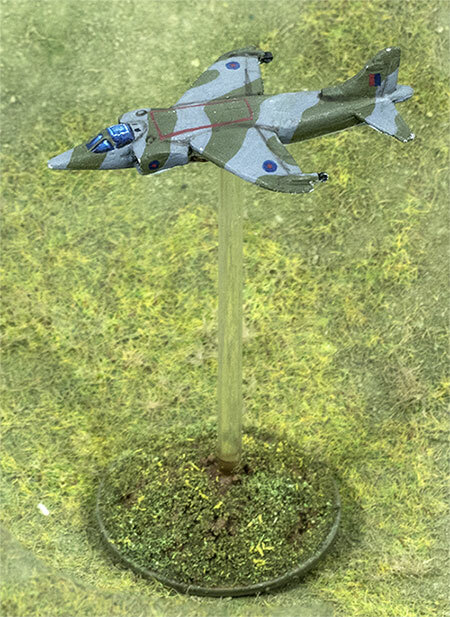 This specific one is a metal Hawker Harrier jet from Heroics & Ros, but I've used the same system to make stands for 1/144 plastic kits as well. 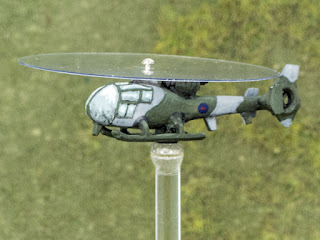 The first thing to address is that a model on the end of a stick needs a bit of weight at the base to make it stable, or else it will just keep falling over and probably damaging the model. 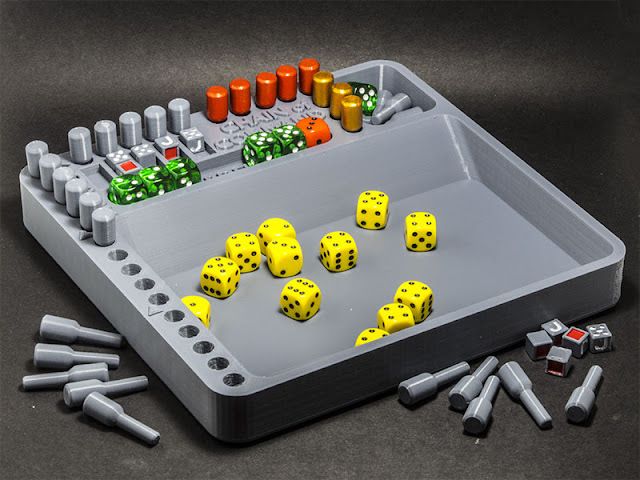 The size of the base and the amount of weight required will depend on how long a stand you want, and the size and weight of the model to be perched on top of it. In this case I'm using quite a short stand, but the metal model is fairly heavy. 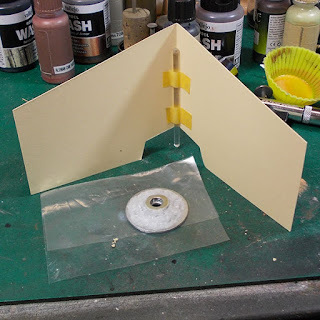 I create the base by supergluing together a stack of fender washers of decreasing size. In this case, the largest one is 32mm in diameter. You don't need to use much glue at all at this stage, just enough to tack them together: there will be a lot more glue going on later. The stand is a length of 3mm clear acrylic rod. I prefer this because it's see-through, but a sturdy length of steel wire will also do the job. 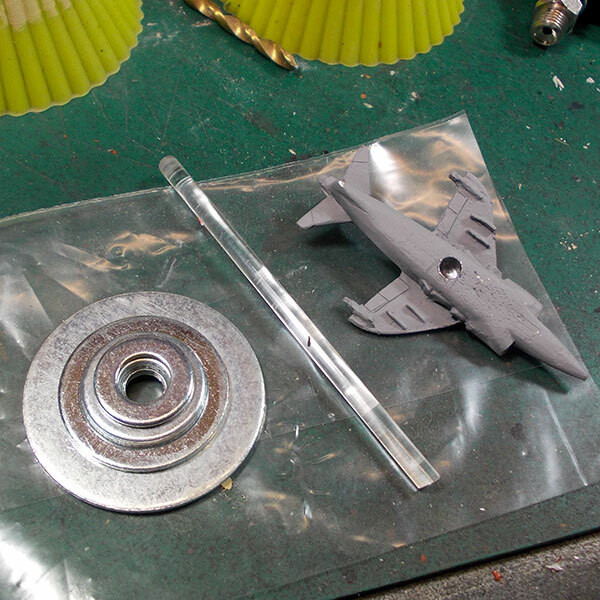 I've drilled a matching 3mm cavity in the belly of the aeroplane model; this one is a tight enough fit that it can just be pushed on and it will stay, but another option is to use a pair of magnets, one glued to the tip of the stand, and the other to the belly of the plane. 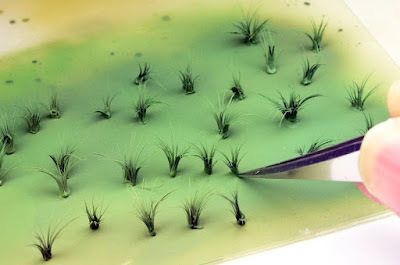 Once I have my base stack, I flood the levels with liquid superglue and then cover it with baking soda. 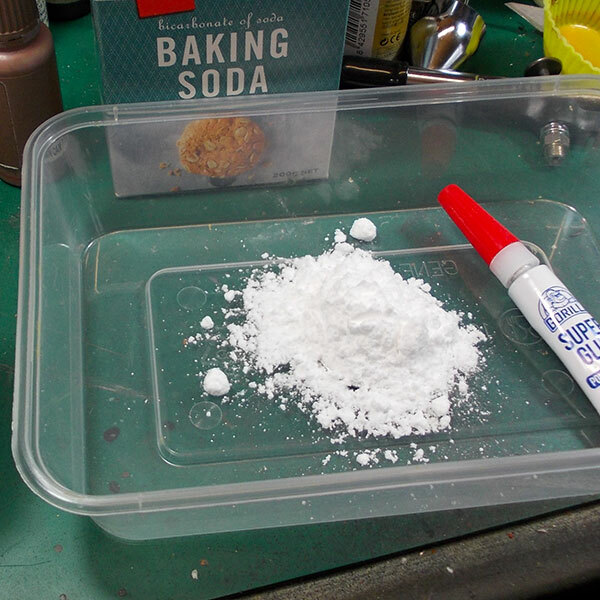 The baking soda combines with the superglue and cures it pretty much instantaneously, and leaves a rough plastic-like mass. The excess is just brushed away — if you're cheap, and it's not going to be used for cooking, it can go back into the box for re-use. 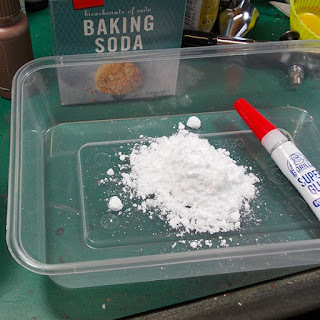 You will probably have to repeat the superglue + baking soda once or twice to get a more or less even covering over the stack of washers and to disguise their edges. The next step is to get the acrylic stand attached to the base. You can see here that I've taped the acrylic rod to a piece of folded card. 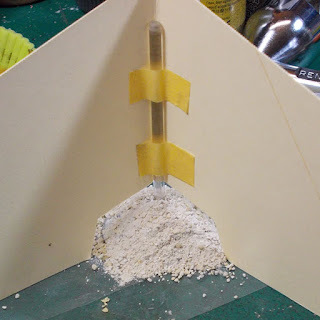 This is to keep it square and vertical in the base while the glue is setting. It's best to make sure that the end of the rod is a few millimetres above the surface of the table; if it protrudes even a fraction of a millimetre below the edge of the support card, it will throw everything out of whack and your stand won't be perfectly vertical. You need to make sure that the card's base is perfectly straight, and that it's folded with that bottom edge matching exactly — that will ensure that the folded crease is perfectly square to the bottom edge, and it will also be perfectly vertical to the tabletop when the card is stood like this. I've cut a notch out of the bottom of the card stand — this is to accommodate the base for the next step. The cavity in the stack of washers is filled with epoxy, and the acrylic rod, taped to its support card, is lowered down into it. 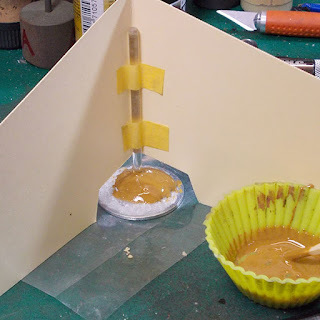 The epoxy in this image is coloured that diarrhea brown because there was a little bit of paint left in the silicon cupcake baking thing I use as mixing palettes. It's not necessary to colour it at all. I had a lot more epoxy mixed up than I really needed, and spread some out over the base. I poured some basing sand over it while it was setting to provide a bit of texture. Once the epoxy has set, the stand is basically done. Now all that remains is to paint and flock the base as you normally would, to match your battle mat or whatever. 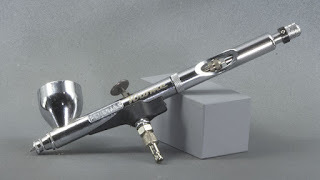 Some time ago, I ordered a Badger Sotar 2020-2 airbrush from a US company. 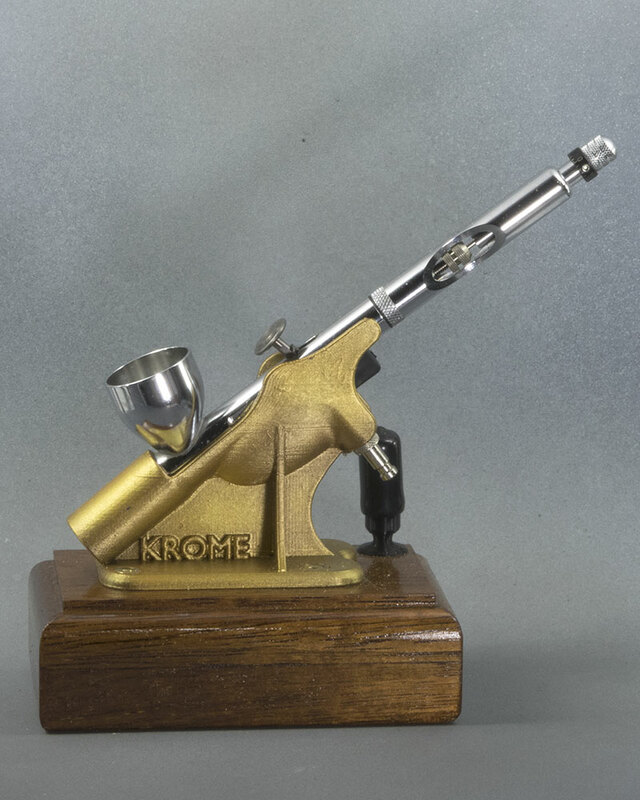 That airbrush has disappeared into the mail-service void, and I don't know at this stage if I will ever see it (or my money) again. So, I bit the bullet and bought a Badger Renegade Krome from MightyApe instead. It's the most expensive airbrush I've ever bought, but since it came out of my Shapeways loot, it sort of feels like free, which is good. 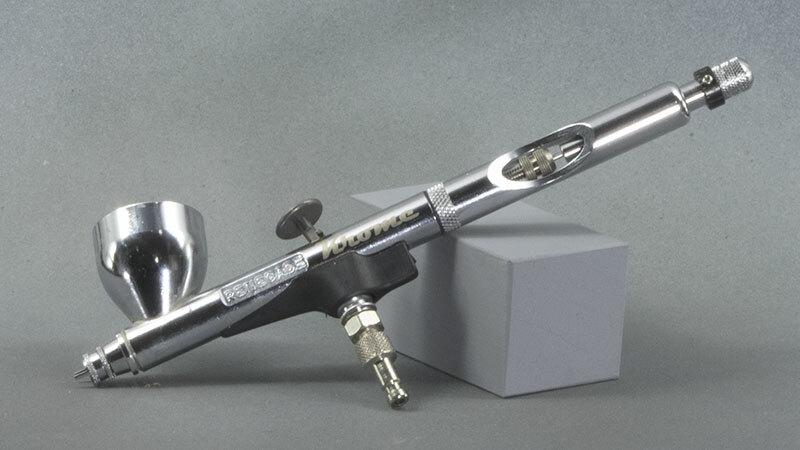 Expensive it may be, but it's also hands-down the best airbrush I've ever used, even on the very brief acquaintance I've had with it so far. Which is very brief, since it only arrived this morning. This model is an old 15mm (1/100) plastic kit from Battlefront, a StuG IIIG. It's one they put out with a beginner's box for one of the editions of Flames of War, and it's not a great model. Though, having said that, it's enormously better than the Sherman that came in that same set, which currently hold the record for the worst plastic tank kit I've ever encountered. I'd given it a pretty basic paint job before, so I just went over the top of that to try out the lining and dusting capabilities of my new airbrush, and I am more than happy. It handles Vallejo paints, both VMC (thinned) and VMA (straight) very well, and it allows me to get in closer, with less spidering or splattering, than any other airbrush I've used. It lays down a very fine mist coat as well, for broader coverage. It points very intuitively, and the paint goes pretty much exactly where I expect it to, which is a very good thing. I think this might be the beginning of a beautiful friendship. Here's the airbrush in its holder, mounted on a block of kwila, a very dense tropical hardwood. Thes guys carry the 81mm mortar, a useful piece of kit for rapid-response infantry artillery support. They can be fired from the vehicle, or they can be dismounted and emplaced — there are dismounted mortars and crews available as part of the Infantry Support Weapons set, or you can buy the mortar sprues on their own. These models are Heroics & Ros 1/300. It's been a little while since I did anything on my 1/300 scale BAOR force. This is the backbone of my armoured component, the Chieftain Mk.IX. They'll be standing in for Chieftains of any mark, because they're all visually very similar in this scale, but if I find I want Challengers I'll get proper models of those. The models are from Heroics & Ros, as usual. I don't know who came up with this idea, but it is genius and I'm definitely going to try it out. I've been sort of keeping an eye on the upcoming Pathfinder 2 FRPG rules. I'm not particularly interested in ever running a Pathfinder campaign; the rules are far too pernicketty and Byzantine for my taste, but I do like to see which ideas are worth nicking. One that piqued my interest is their new level progression rules. Every level requires a base 1,000 experience points to advance. First to second level? A thousand. Fifteenth to sixteenth level? Still a thousand. If the GM decides they want progress the game faster or slower, they can just adjust that base number up or down, but it still remains the same for every level. Naturally, this would require considerable judgement by the GM. If that first-level party defeated a Hideous Bugblatter Beast of Thraall, it would be worth a lot more experience to them than to the fifteenth-level party. The number of experience points granted for any given session would be highly situational, and to a certain degree subjective. I haven't actually seen the PF2 playtest documents (yet) so I don't know what, if any, guidance is given to the prospective GM in this respect. I assume there's some. Anyway, it's an idea that I rather like. It would be possible to transfer it to AD&D, but it wouldn't be a seamless transition: the AD&D level progression rates are a bit.... peculiar. Some classes progress much faster than others initially and then slow right down, some get a speed boost at the mid-levels. Pretty much every class has its own particular level progression numbers for any given level. Frankly, it's a bit of a mess. Once upon a time I worked out line graphs to chart the relative advancement rates of all the classes, but where that work is now I have no idea. 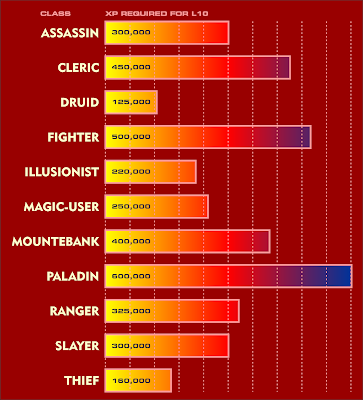 To an extent it could be modified for AD&D by giving each class its own base advancement rate to reflect the relative effectiveness of the class: I'd probably set Fighters as the standard, at 1,000xp per level, while Rangers might be 1,100 and Paladins 1,250. Thieves would be faster at, say, 900, while Magic-users and Clerics I'd probably set at about the 1,100 to 1,300 level. The thing that I like best about this system is that a player will always know, at a glance, how close they are to advancing in level. No more need for XP charts at all. 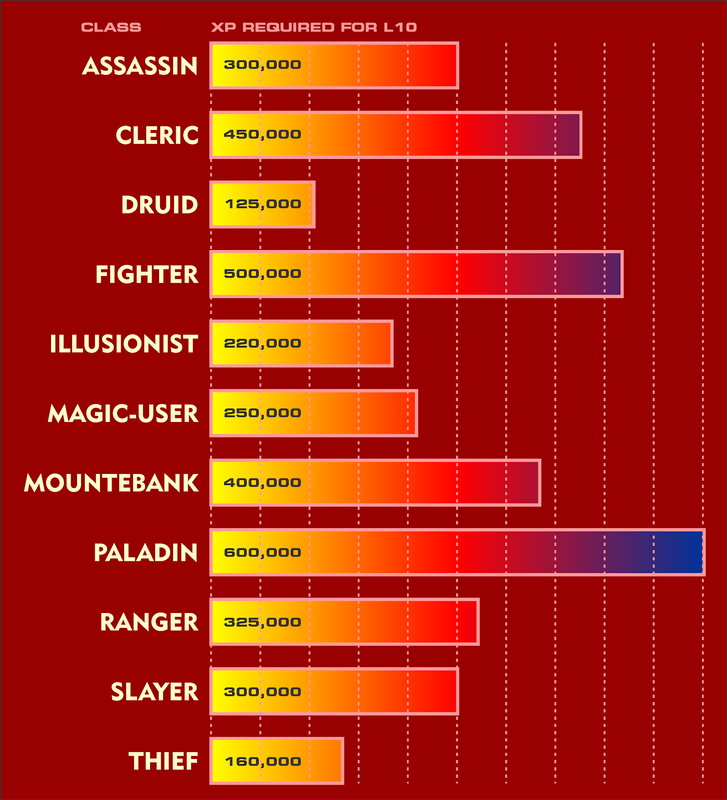 I started to work out the relative progression speed of the various classes by taking the number of XP required for each to reach level 10 (from OSRIC) and turning it into this bar chart. The results surprised me quite considerably. I'd never really taken any notice of this before; I was vaguely aware that Thief progression was quite fast, but I'd always assumed that the Fighter was one of the more average classes in that respect. I was quite wrong. 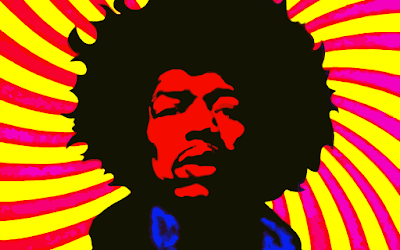 Druids, Thieves and Illusionists all scamper up the level hierarchy in the blink of an eye compared with pretty much everybody else. Clerics, Fighters, and Paladins trail behind, progressing excruciatingly slowly comparatively. To be frank, I can't really see why, except maybe to make pretty lame classes like Illusionist attractive to players — but then, Druids are pretty goddam scary, so why would they need to be helped along like that? It can't be because of the characteristic requirements of the class — Paladins are really crippled in that way, yet they advance the slowest of them all. I suspect the relative progression rates were set pretty much at whim. I think I might just compress everything. Probably quite a bit. I've decided I am definitely going to adopt the "1,000 XP per level" system for all classes, for all levels. I was going to adjust the amount of xp/level required by class according to the advancement rates shown in the existing XP table, but I cannot, for the life of me, figure out why some classes advance at different rates than others. Sometimes remarkably different rates. I can understand the desire of the designers to allow different advancement rates, but there seems to be little consistency to them. This will mean a little bit of arithmetic to begin with, since we'll need to know what percentage of the XP you need to advance from your present level has already been achieved for each of your classes, to work out how many you've got right now. It'll also necessitate a change in the "gp for XP" training fees, and I think I'll just set them at a straight 10 gp per XP because it's easy to work out. That will work out considerably cheaper for higher-level characters, but I don't really mind that. If nothing else, this is going to make it easier for me to assign non-monster-killin' in-game XP rewards. Ten points for Gryffindor, for exceptional pluck! I think I'll also look at allowing players to spend XP in the same way as Fate Points or Hero Points or whatever you want to call them. I'll have a think about the cost of things like re-rolls and the like; I don't want to make them cripplingly expensive, but neither do I want them to be a trivial cost. 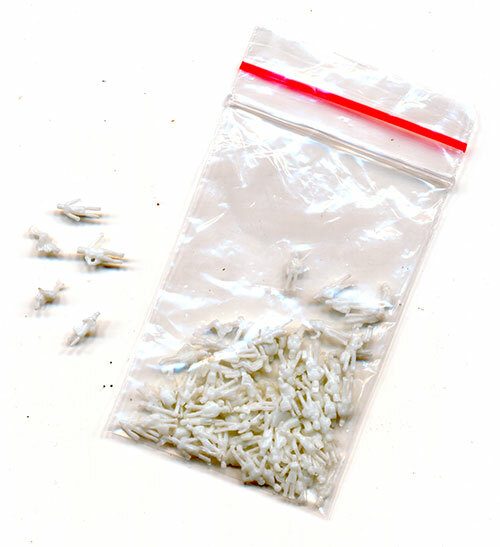 I bought some tiny plastic people, described as "architectural figures", from China, via AliExpress. They were advertised as being 1/300 scale, but the standing figures are about 9mm tall, which would make them closer to 1/200. I intend to use them separate from my vehicles and what-not in any case, so the scale differential is not a huge deal. They'll mostly end up as bases of hapless refugees and the like. 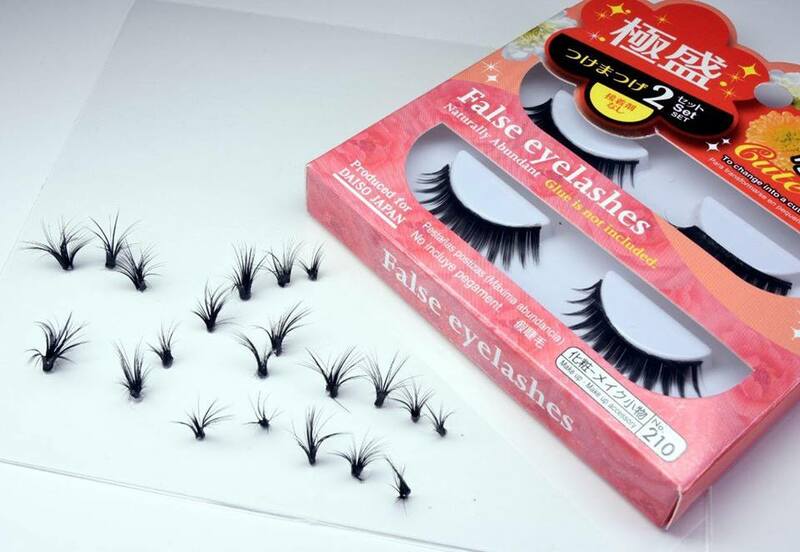 They cost almost nothing; about a buck and a half for a hundred of them. So, I've got 500 potential displaced persons.